Thanks to the smoke alarm, house fire fatalities are rarer than ever. However, fire still poses a real threat to those still without an alarm, and those who fail to look after theirs. The impact of smoke alarms on household safety is impossible to overstate. Statistics show that as smoke alarms have become more common in UK homes, the fire fatalities numbers have fallen. Twenty years ago only five per cent of households had alarms, now this figure is up to 80 per cent. By giving people those precious minutes to escape from fire, deaths from house fires are now at their lowest level since records began in 1959. The smoke alarm is one of the most significant inventions of the last century, and its value was highlighted by a recent survey where UK residents voted it their most important gadget. However, despite this glowing endorsement, smoke alarms are still far from a standard feature in every UK home. They may have made the homes of millions of people safer from fire, but for those who have failed to fit one, the house fire is as deadly as ever. During one year there were 7,310 injuries and 199 deaths resulting from 36,500 accidental home fires. In 80% of the fatal fires there has been found to be no smoke alarm. Despite repeated warnings about the risks of not fitting a smoke alarm, dwelling fires still continue to destroy the lives of inhabitants of homes without an alarm. Fire bosses in South Yorkshire recently issued a warning to local residents when, in the space of 24 hours, two people died in fires in homes that weren’t fitted with smoke alarms. One of the victims, a 58-year-old woman, was found dead in bed at her home in Sheffield after inhaling the carbon monoxide fumes in her sleep resulting from a fire started by a discarded cigarette. If her home had been fitted with a smoke alarm then it would have likely woken her and enabled her to escape. However, simply owning a smoke alarm is not enough. An alarm must be well maintained otherwise it is useless. The major concern now is not so much the absence of smoke alarms, but the number of poorly maintained devices - disturbingly one in three smoke alarms fail to operate in the event of a fire. A smoke alarm must be tested weekly to ensure that it stays a potential lifeline for many years to come. The danger of not regularly checking your alarm has been highlighted by a recent national Fire Kills advertising campaign that coincided with the smoke alarm’s 40th anniversary. ‘Pull Your Finger Out’ showed the destructive and potentially fatal consequences of not testing your smoke alarm often enough. In the television advert, actress Julie Walters reminds viewers about the importance of regular checks, whilst standing in front of the horrific aftermath of home kitchen fire. Specialist television and press advertising campaigns were also launched targeting the Indian, Pakistani, Bangladeshi, Chinese, Somali and Polish communities, to try and reach individuals that are alienated from general mass media. 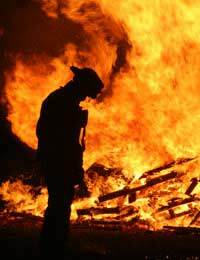 By being ‘disconnected’ from English-language media, these communities experience the lowest of awareness or understanding about the risks of fire, and are therefore at the highest risk. Previous campaigns have met with real success. The ‘Fire Starts when your Attention Stops’ targeted kitchen fire safety, and as a result saw chip pan fire injuries decrease 23% on the previous five year average. ‘Put it Out, Right Out’ helped hammer home the message of the fire risk posed by cigarettes and helped reduce smoking related deaths by a fifth.